My Felty Doppelganger – Hey, Look! A Writer Fellow! From left, Ellen and Mike. My wife, Ellen, describes our relationship as very similar to Bert and Ernie’s. And she’s absolutely right. I’m Bert. While I have never considered collecting bottlecaps or becoming a pigeon fancier, I do have a rather large collection of Nixon political buttons and own two pet rats. Like Bert, I am also a fussbudget who likes things to be in their proper place. Another similarity: Bert is the kind of guy who, without Ernie by his side, would live the life of a hermit, emerging from his house only to buy food and confiscate the Frisbees that accidentally land on his lawn. His death would be noticed only after the neighbors started to complain about the smell. Without Ellen, I could see myself moving in this direction. I wouldn’t necessarily be happy about it, but is seems like something I might do if left to my own devices. Ellen is Ernie. She’s disorganized, peppy, sociable, friendly, and has an easy laugh. Also, she, like her Muppet alter ego, takes giddy delight in getting her Bert’s goat. Look! 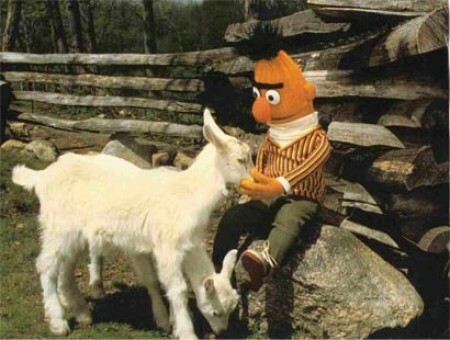 Bert even likes goats! If Bert was real, he and I would be best friends! But when night falls, things change. After the lights are turned off and the house becomes quiet, Ellen and I experience a sort of role reversal. Night is when the silly ideas start to fill my brain and I, like Ernie, have an insatiable desire to share. “Mm,” she replies into her pillow. Ellen, like Bert, is less than thrilled by all of this. “I will kill you,” she says. From left, Mike and Ellen. I also come up with ideas that I can use, too. Good ones. My best ones. I share those, too. I don’t mean to be a pest, it’s just when I lie there in the dark, my mind becomes so very fertile. This is why I love quiet moments. This is why, during the day, I become Bert the loner. And it is also why, at night, I come dangerously close to becoming Ernie the murder victim. So! Let’s open up the comments section. Here’s a prompt: Which Muppet is your alter ego? Yay, the Muppet post!! I have to say I feel a kindred connection with Oscar the Grouch. 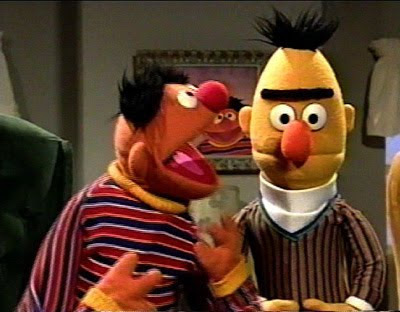 My husband is very Bert-like most of the time too, except when he suddenly morphs into Ernie, which makes me even more grouchy. Did you ever finish those Pickle Man lyrics? Because I would enjoy hearing them. I’ve always had a soft spot for Oscar. This is especially true now that I am a property owner – for now I can fulfill my lifelong dream of telling neighborhood kids to get off of my lawn. Yes, there are more verses to “The Pickle Man. ” Many, many more. In fact, the song is about as long as a Wagnerian opera – and every word of it is too idiotic to share. Ellen will back me up on this. I’d love to be Rowlf or Floyd, but I’m afraid I’m mostly Beaker . . .
Glad you sought an explanation for that Miss Piggy comment. That could’ve created a whole new set of mother/daughter issues at some point down the line. Rowlf is wonderful. He is probably my favorite Muppet and is definitely the Muppet version of the dog I hope to one day own. Seriously, though, I make up parodies all the time. Yet no one ever appreciates them. Maybe we could swap parody critiques. Hm. Perhaps this may be the subject of a future blog post. Wanna do a Point/Counterpoint with me? In the classroom in which I’ve worked the most, music is a big part of the curriculum. We’ve often switched the words of favorite songs, incorporating the kids’ names into the songs to make it fun for them. It’s OK to be Beaker as long as your spouse is not Dr. Bunsen Honeydew. I always wanted to punch that abusive doctor is his fat, felty, eyeless face. Mike’s post today was brought to you by the letters B and E and the number 2. I think I might be Kermit – puts up with a lot, pretty even tempered, holds things together (Boy, I’m making myself sound really fun aren’t I!). Kermit is the lone sane Muppet in an otherwise insane world. I was always a big fan. I also admire that amphibian’s journalism skills. Sesame Street News is, in my view, the only media outlet that can honestly describe itself as being fair and balanced. That paints such a funny picture! You’ll have to start taking a dictophone to bed with you. My brother and sister would probably say I’m gonzo. I’m saying nothing. You can do a lot worse than Gonzo. Weird, yes, but so sunny and charming. And I vehemently disagree that I am anything at all like Snuffaluphagus. I can’t even spell it correctly! Just call him Snuffy, then. He’s a wonderful fellow – especially now that he’s finally proven to everyone on SS that he is NOT imaginary. And, by the way, I plan to discuss Snuffy’s vexing early behavior in a future post. I love this post! You and your wife are so cute, and you made it relate-able to kids with the muppets reference. I took a quiz and it seems I’m most like Count Von Count. The Count was a passonate fella. Gotta respect that. You should probably fear it, too, cause, man, that guy’s a little nuts. I’m gonna have a hard time getting that thought outta my head. Wow. What a fun post! I always loved Ernie. 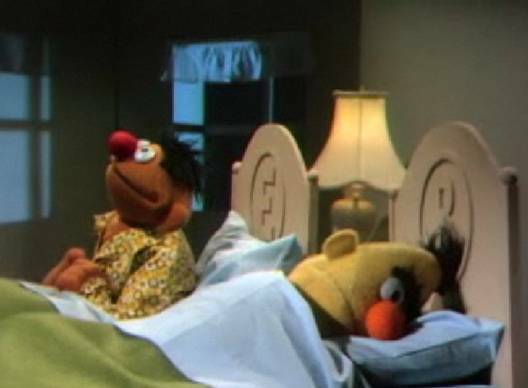 Bert was a bit of a buzzkill… but like you said, I guess we all play Bert or Ernie at one time or another. As for Muppets, I think I’d be Animal, maybe? He has more energy than I do, but he doesn’t waste his time doing stuff he doesn’t want to do! Animal? Yikes. The fellow is a living breathing id! Are you sure? Well, I wondered how restricted we were to Muppets. If Sesame Street is in play here, I was always a Big Bird fan. All Muppets apply. The Dark Crystal? Fine. Fraggle Rock? OK. David Bowie in Labyrinth? Well, you’re probably pushing it there. Statler and Waldorf. Me in 25 years. Haha as a girl my sister and I had bert and ernie dolls. I like the comparisons, and love the muppets! Good to hear. I trust no one who doesn’t like Muppets. The elf you speak of is named Hermie and he was in the Rankin/Bass production of Rudolph the Red Nosed Reindeer. Frosty was also Rankin/Bass but was drawn animation. There was a snowman in Rudolph, too, but he was of the “abominable” variety. The Muppet I’m the most like is Fozzi Bear. It might be the terrible puns, or the rubber chicken. My family finds them unbearable, and will barely stay in the room when I’m baring my words. I’ll bring the wine and a lovely crab dip. My husband is guilty of the “hey, I see you are snoring and drooling over there, but can I tell you about this thing at work?” ARGH! I had to make a journey to Sesame Place yesterday for research. I’ve decided I’m like the new guy Murray. He likes to try new things, gets super excited about small things, and busts a sweet rap. I know of Murray but have never seen the fellow in action. YouTube here I come! Your comment also begs a question: What kind of “research” are you doing at Sesame Place? Not The Muppet Show, but Sesame Street. But, yes, Cookie Monster is a full-blooded Muppet! On any given day, I am Bert, Ernie, Oscar, Kermit, Test Tube, the Swedish Chef, Miss Piggie, and, occasionally, Animal, all at different times. And then there are the two old codgers in the balcony. I do like getting in the wise cracks and puns whenever possible. I guess I could be my own muppet show, but I’m not nearly as cute as all those guys. There is a little Muppet in all of us. But you seem to have a little of ALL the Muppets in you, which is both cool and alarming. This was hilarious! I’m totally Bert. It takes me forever to warm up to people, and once I do have my moments of pure insanity. But most of the time, I’m content to be on my own ruminating or reading or just doing my own thing. There’s nothing I like more than just being in the same room as my family or friends. I don’t actually have to talk to them. There’s something satisfying about seeking quiet in companionship. I agree with you completely. The most valuable relationships, I find, are the ones where there’s no pressure to fill the silences. Adorable post (although you probably don’t like to be in the ‘adorabale’ category). I more like Bert, although the Ernie side of me pops out more often than expected. I think the older I get, the more willing I am to be goofy and funny around people. I don’t seem to care as much that they think I’m a bit weird. :+) Thanks, fun post (and yes, still adorable). Oh, I can be adorable. By the way, congrats on winning a copy of Sarah Gives Thanks over at David’s blog! I hope you enjoy it! Oh my gosh, I did???? (win the book?) YIPPEE!!! I didn’t know it. Remind me how to get back on David’s blog so I can see that. Yay, I never win anything. Well, I am glad to be the bearer of good news! Animal. I love him. Sanity is not his strong point. Nor is it mine.